Sleeps two adults and two children. Landscaped level pitch - choose your own pitch in our 3-acre grassy meadow with countryside views. Landscaped level pitch with EHU. 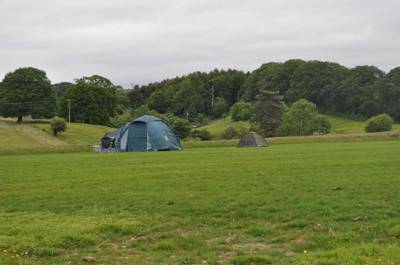 We have two pitches with an electrical hook up in our 3-acre grassy meadow with countryside views. 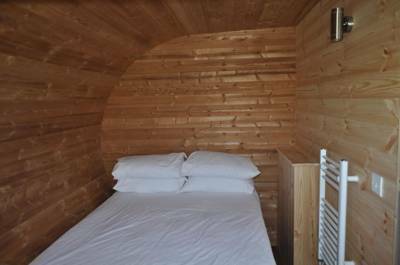 A cute, hand-crafted Gypsy-style camping pod for 2 people, with the luxury of a real bed. There are no special prizes for guessing how the town of Ironbridge got its name. Huddled along the banks of the River Severn and made up of a mix of Georgian houses and small independent shops, the settlement is almost entirely orientated around its central, cast-iron bridge – the first of its kind in the world and cause of much celebration in 1779 when it first opened. Not all the excitement has died away. In that strange way that the world goes round, this once modern and famously new era bridge is now celebrated for its age and history – a physical reminder of the area's rich industrial history. The resulting town is a wellspring of museums and attractions. You can venture underground in the Tar Tunnels, peer through the galleries at the Jackfield Tile Museum or sniff at curious remedies in the Victorian Pharmacy, all infused by what has, overtime become a surprisingly excellent spot for eateries in West Shropshire. It’s a painless ten-minute walk from town to Irongorge Campsite, a secluded rural spot on the settlement’s western edge. Or at least that’s how long the walk is to the first couple of museums. To wander down to the bridge itself takes a further 20-minutes or so, ducking in and out of shops not included. The campsite itself echoes the spirit of the town. Small, independent and welcoming, it’s a family run spot with excellent views over Wrekin Hill – a hulking natural landmark that can apparently be seen as far away as Manchester’s Beetham Tower. 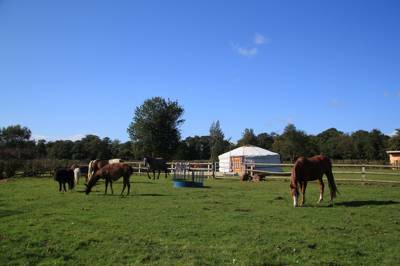 In total there are just 12 grassy pitches (despite the whopping 14 acres of space the smallholding affords) with a restriction to just tents giving it a thoroughly laid-back, traditional vibe. Campfires blaze in firepits crafted out of old washing machine drums and children run freely around the far end of the field. Bliss indeed. The fact that cars are banished from the camping field adds to the quiet vibe, and it's all part of the fun to wheel your kit to your pitch in one of the trolleys provided. 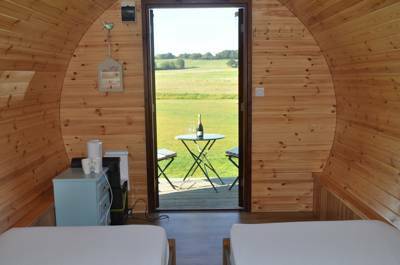 The notable exceptions to the tents-only rule are a pair of timber glamping pods, the first with two single beds and the second sleeping up to four, with a large double bed and two berth-style singles that act as a seating area by day. Linen and pillows are provided, though you need to bring your own duvet or sleeping bag. Together the two sturdy structures provide a cosy alternative to camping (particularly in the winter months) but still feel wonderfully connected to the rest of the site, as opposed to tucked quietly away on their own. In all the campsite is a wonderful space for families, couples or groups, looking for that authentic campfire by night, pooh-sticks by day sort of escape. Ironbridge’s ten museums mean wet weather days will never be a problem, while the footpaths leading directly from the campsite and the proximity of the heather-strewn Shropshire Hills make it a hot spot for outdoors enthusiasts too. The only downside, of course, to such a small, well-run site is that it doesn’t take long before the “sorry, we’re full” sign is swinging from the gate post… All the more reason to snap up a booking while you’ve got the chance! 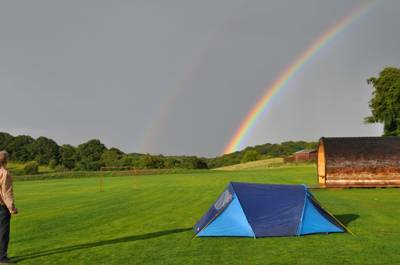 Iron Gorge Camping is located in a hillside position above the Severn Gorge, offering both camping and glamping accommodation within a mile of the World famous Ironbridge. It is an ideal base to explore the birth place of the industrial revolution whilst enjoying the beauty of the Severn gorge. For latest availability and best prices for IronGorge Camping, please use the Date Search above. 12 grass pitches, 5 pods, a Shepherd's hut and 2 bell tents. Note that the tent field is car-free, so you'll need to park up and transport your gear in the trolleys provided. Flat level pitches with good views over the Wrekin Hill. We have several pitches with electricity . A new toilet block features toilets, showers, sinks and a separate washing up facility. Campfires are allowed in specially made fire pits, allowing you to cook over an open fire. Dry logs and BBQ coals are available for sale . 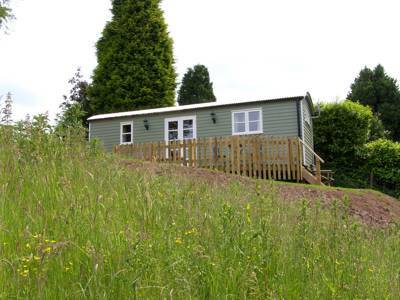 The campsite overlooks Wrekin Hill, a popular spot for mountain bikers and hikers alike. It's about a 4 mile drive to the foot of the hill, via the quiet village of Little Wenlock where there is an excellent pub (01952 503300). At the bottom of the hill, there is a designated parking area with 'the Wrekin Trail' clear and easy to follow. For cyclists there is also a good route at the bottom of the campsite's farm track – route 55 on the national cycle network. It's also a very short walk (10 minutes) down to the banks of the River Severn where canoeing, raft tours and fishing are all on offer. The obvious offsite attraction, though, is world famous Ironbridge (01952 433424), right on the doorstep. There are no fewer than 10 museums within the gorge, including a recreated Victorian town at Blists Hill – a must visit while here. Ironbridge has a host of bars, pubs, tearooms and eateries. For simple fare the Ironbridge Fish and Chip Shop (01952 432222) is a firm favourite, while The Malthouse (01952 433712) serves decent gastro pub food and acts as a venue for shows and comedy. While the best spot location-wise is The Tontine Hotel (01952 432127) – directly opposite the world famous Ironbridge (their carvery is particularly good). Finally, The Black Swan (01952 882471) in Jackfield, overlooks the River Severn and has a fantastic beer garden in summer, serving excellent but traditional pub fare – highly recommended. £9 per adult; £4.50 per child over 3 (under 3 free); £1 per dog. Bell tent £50 (based on 4 sharing); Pod 1 £45 (sleeps 2); Pod 2 £60 (sleeps up to 4).Shepherd's Hut £70. 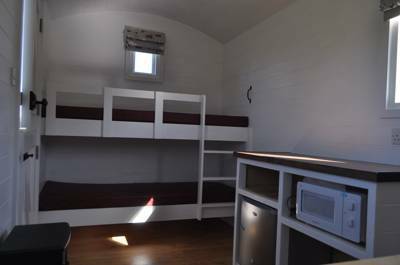 Glamping options include bottom sheets and pillows in the price. From Ironbridge: Cross the mini round about at Dale End by the co-op (River Severn is on your left). Turn right up Station Road passing under a railway bridge (do not go up Strethill Road). Continue up the hill until you get to a track with a sign that states “unsuitable for heavy goods vehicles”. Turn left up the track and continue until you get to the large tree stump. Keep left and you will reach a tarmac road. Pass the first house and turn left into the field and up the track to the campsite. The nearest train station is in Telford (08457 484950) but from there it is a 6 mile drive to the campsite.